Stop me if you’ve heard this one before. A disgraced journalist is brought into a case involving a young woman who has disappeared from her father’s million-dollar estate. He teams up with a plucky female sidekick to figure out what’s going on, and ends up way over his head. 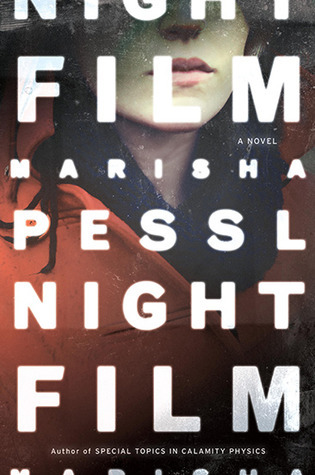 While I could easily be describing Stieg Larsson’s The Girl with the Dragon Tattoo there, these are also the broad strokes that lie behind Night Film, author Marisha Pessl’s followup to her wildly successful debut Special Topics in Calamity Physics. I’ll admit to having fudged a few bits in that description, yes, but for what’s being marketed as a “literary thriller”, what we’re given in this book is a bit undercooked on both fronts. Here’s the real synopsis: Scott McGrath is a journalist who lost his reputation after getting involved in the affairs of Stanislas Cordova, a famously reclusive and wealthy horror movie director. When Ashley Cordova, the errant daughter of Stanislas, is found at the bottom of an elevator shaft, McGrath and two young well-wishers delve into the world of the director’s films in order to figure out why she killed herself. Stanislas Cordova is presented to us as a chimera, an American-bred combination of Stanley Kubrick, Mario Bava and Brian de Palma, who’s as much of a hidden enigma as a Salinger or Pynchon. His filmography started with studio-made features, but later films ended up as a collection of samizdat fetish items due to their supposed scariness, and the lengths some psychos went to reenact events in them. He and his films are obsessed over by rabid fans known as “Cordovites”, who frequent secret members-only websites called the Blackboards to discuss. There’s a bit of a problem with this setup, though, as throughout the narrative we get few descriptions of the films, and only one other character apart from the protagonist who really expounds upon them, a university professor named Beckman. We are led to believe that watching them is an almost religiously scary experience, something akin to the eponymous “Infinite Jest” movie, but we as readers aren’t really given enough to go on. There isn’t the description of film history and technique you get in something like Theodore Roszak’s great novel Flicker, nor is there the extensive examination of the filmography like in Infinite Jest. To me, anyway, it felt like the author thought it’d be cool to have a reclusive filmmaker at the heart of a standard mystery story, but didn’t really want to delve deeply into why people like horror movies. There is a cool bit of business as the protagonist’s story starts to mirror some of the narratives in the films, but without a context for why these films are so obsessed over, this didn’t really stand out from other sorts of evil schemes we’ve read about before. So as a mystery, then, the book is also somewhat sluggishly paced. The protagonist, in what kind of drove me crazy by the end of it (maybe that was the point…) continually just bribes people to give him information. There isn’t the trickery of a Sam Spade or a Marlowe here, even through the latter is name-checked, nor the brutality of a Mike Hammer, no, in this book we get a guy with a decent-sized pocketbook. There’s also a particularly annoying tendency in McGrath’s voice to italicize words for emphasis all the damn time. If like me, you read an italicized word as something spit out, or maybe shouted, reading this verbal tic gets old very quickly. The weird nature of the plot may also have something to do with what’s intertwined with the story production-wise. At certain points in the book, smartphone-users can scan the page with an app, with extra details like music, interviews, poetry readings, etc. getting downloaded and played. While I can’t say the idea is the worst I’ve ever heard, I actually like the way Marvel Comics has done something similar with their “Augmented Reality” panels, in Night Film the technique didn’t really do it for me. Combined with the text’s overuse of images, websites, newspaper clippings, even a bit from a telephone book for some reason, rather than descriptions of these items, the actual reading of the story is kind of a choppy and sluggish experience. I can appreciate what the publisher was trying to do here, but I feel this sort of stuff would probably work better in the ebook form of the story than in the hardcover. The images appearing in replicas of websites like Time Magazine, or Vanity Fair, have a strange airbrushed look to them, which I found distracting. I didn’t mind the first few pages, which are a Time “picture essay” which sets up what’s known of Cordova’s life and family. Overall, though, I found this book a less than stellar experiment. I guess I was compelled enough to finish the story, but if you’re looking for something with a better use of film imagery and history I’d recommend Flicker, or even Stephen Romano’s Shock Festival, which tells the story of a whole grindhouse film scene by use of posters, lobby cards, that sort of thing. Matt Bowes is a self-proclaimed cultural commentator/arbiter of good taste from Edmonton, Alberta. He enjoys movies and books, and writes about them sometimes at thisnerdinglife.com.